A friend recently directed my attention towards the Tyndale House Greek New Testament. It’s not a bad idea, as far as editions go. They try to determine what the actual first-century spelling or pronunciation of the words at hand was and then use it, rather than a levelled-out, standardised, modern-Classical Greek spelling. This will please those of the ilk who like to see Cristus in medieval Latin instead of Christus. It is also, apparently, designed simply to be read, which is a fine idea as well. From what I’ve read on their blog, it seems that sound philology lies behind this edition of the Greek New Testament. It seems that Dirk Jongkind (whose work on the scribal habits of Sinaiticus I’ve actually read) and team should be pleased. I shouldn’t be snarky. I should, as a (Latin) text critic be happy to see the science itself flourish and get publications. Except, I wonder — is this evidence of textual criticism flourishing and getting publications? Or do all of our promising Greek scholars with an interest in ancient Christianity find themselves beating to death the text and mss of the New Testament with no new major ms finds for years? I think the reason why NT textual criticism is innovative is twofold: 1. They have way too many mss and frags to deal with. 2. There are so many of them (scholars, that is). Anyway, the point of this rambling rant is: Could you please divert your skills and resources and attention to something else? I, myself, am working on texts that haven’t been edited since 1753 (the letters of Leo the Great), for the most part, but also a couple that haven’t had any work done since 1723 (Coustant’s edition of the popes before Leo). This afternoon, I was looking at Durham Cathedral Library, B.IV.17, a twelfth-century copy of the Decretum of Burchard of Worms. Now, Burchard hasn’t been edited since 1748, but he’s at least had some very interesting textual criticism done since they found his autographs. Those texts are Latin, I realise. But if the Greek Bible is of interest to young minds, brimming with linguistic knowledge, wouldn’t it be nice to see the Septuagint get some of the love? We have that German Bible Society edition, but that’s not fully and truly critical, and La Bible d’Alexandrie is not yet done, from what I can tell. This is the Bible Paul of Tarsus read, people; the Bible of Justin Martyr, of Clement of Alexandria, of Origen, of Athanasius, of John Chrysostom, of the Greek priest next door. From a purely academic standpoint, this is a hugely significant text in need of a lot of work. I know people are working on it, but they seem mostly to be French or German. And what about the texts of the people who helped forge Christianity? The Apostolic Fathers aren’t the only ante-Nicene texts that could do with some sprucing up. And even if one stuck to the Apostolic Fathers, they only have three editions, not 28. Consider Clement of Alexandria, turn of the third century; Sources Chrétiennes lists the following if his texts as not even having someone to work on them: Canon Ecclesiasticus, Hypotyposeis, letters, De pascha, and several fragments. Anatolius of Laodicea (d. 280-90) has no one lined up for De decem primis numeribus. If you had the inclination, you could go through their list and see who else they haven’t finished. There are many. Moreover, just because someone has an edition in Sources Chrétiennes or in the Corpus Christianorum doesn’t mean it’s any good; I heard a rumour about a recent text of something by Origen (which I forget now) being worse than Patrologia Graeca. And why should we, as scholars, invest in Patristic textual criticism rather than the New Testament? Not only because the New Testament has probably been overanalysed and done to death, but also because knowledge is good. Philology and philosophy and theology and history rest, to a large degree, on the texts we read them in. If those texts are bad, we are missing some of the nuance, some of the beauty, some of the philosophical accuracy, some of the historical detail. Besides that, all those New Testament manuscripts people like to read are contemporary with or later than the Greek Fathers who need work done on them. Codices Vaticanus and Sinaiticus are post-Constantinian. Claromontanus is sixth-century. P45 is from around 250 — so contemporary with Origen and later than Clement of Alexandria. These are the writings and beliefs and ideas of the people who copied out the texts that transmitted the New Testament. Getting to know them and their world should really be part of the same intellectual enterprise as getting to know the New Testament. And if you’re good enough at Greek and wanting to branch out, maybe give some pre-Christian Hellenistic texts some love. They need it, too. This entry was posted in Ancient World, Books, Christianity, Classics, History, Indignation, Patristics and tagged clement of alexandria, history of texts, manuscripts, new testament textual criticism, septuagint, text editing, textual criticism, tyndale house greek new testament, vienna genesis on December 18, 2017 by MJH. Last night I had the pleasure of attending the inaugural lecture of the Durham Centre for Ancient and Medieval Philosophy (DCAMP), delivered by Prof. John Magee of the University of Toronto. I have long had respect for Magee since he taught me Greek prose composition and supervised my MA research on John Cassian back in Toronto, and it was a pleasure to see him in action, showing us what philology can do as well as the intimate links between ancient and medieval philosophy. His lecture was about the text of Boethius’ elementary commentary on Aristotle’s De Interpretatione. 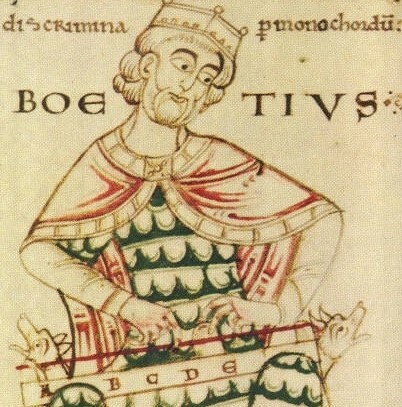 Being fond of Boethius, as readers of this blog will know, I was happy to encounter an aspect of this Late Antique philosopher I was unacquainted with. 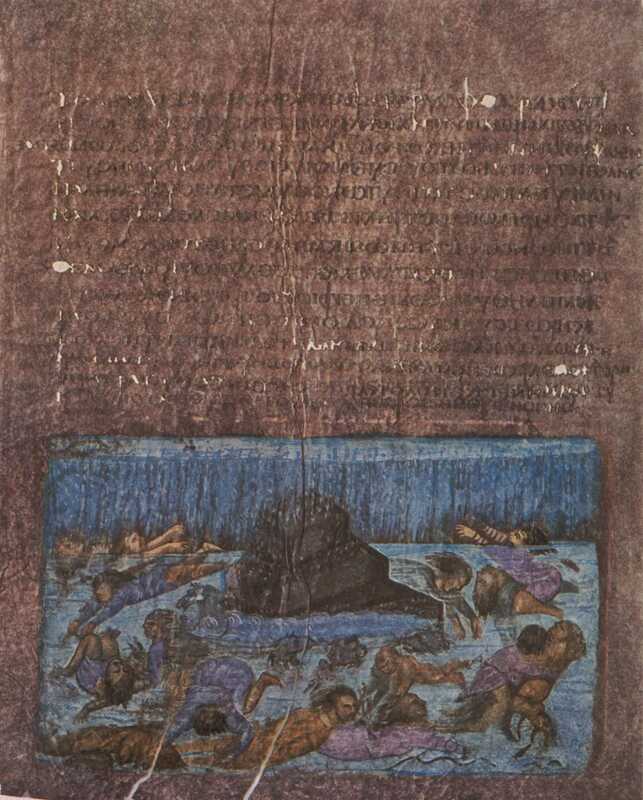 What Magee did was use philology and manuscript studies to narrow our gap between the death of Boethius in 524 and the first manuscript of this commentary. This was done by considering references and quotations from Boethius in sources related to Cassiodorus’ monastic centre at Vivarium in Italy and by looking at traces of editorial intervention before the appearance of the manuscripts. In short, what we see is Aristotle being read in Latin in western Europe, alongside Boethius’ commentary, between 580 and 800, and particular uses of Boethius’ translations being made in western Frankland. This is the sort of thing I like, and it inevitably made me think of Leo the Great and the period between his death in 461 and 600 or 700 when the first manuscripts with his letters appear. The methodology is the same. It is also important because the way this Aristotle and this Boethian commentary were being used anticipates some of the developments in the study of philosophy in the High Middle Ages, such as the Logica Vetus. Moreover, we are reminded that parts of Aristotle were current in western Europe before 1123, and, in fact, were being read before we even have manuscripts that survive. And, for those who are less interested in the history of philosophy, perhaps, this Aristotelian world also helps us see Charlemagne and his court and that Renaissance more clearly. It was a pleasure to engage with a talk that brought into play philosophy, philology, palaeography, manuscript studies, and history — and even a moment of art history for good measure! I look forward to DCAMP’s upcoming events. This entry was posted in Ancient World, Books, History, Literature, Mediaeval, Philosophy and tagged aristotle, boethius, cassiodorus, de interpretatione, durham centre for ancient and medieval philosophy, john magee, manuscripts, textual criticism, vivarium on October 12, 2017 by MJH. In his History of the Franks, (written ca. 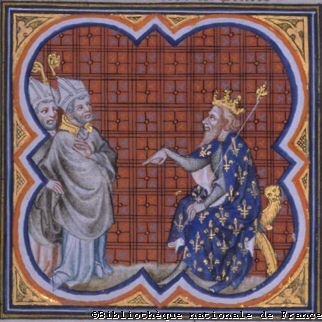 593/4) 5.18, Gregory (Bishop) of Tours provides a lengthy description and discussion of the trial of Praetextatus, Bishop of Rouen, by King Chilperic who was accusing Praetextatus of colluding with Chilperic’s enemies and selling/giving away some of the king’s goods for his own profit. Eventually, despite Gregory testifying in the trial as to Praetextatus’ innocence, and the worthiness of Praetextatus’ testimony, some of Chilperic’s cronies trick Praetextatus into making a confession that he had colluded with Chilperic’s son Merovech to have Chilperic murdered. Praetextatus’ hope was that he would receive mercy and clemency from the king. King Chilperic, unfortunately, was operating to please his wife Fredegund. And if a Frankish king or lord is ever doing something nasty because of his wife or mistress in Gregory’s History, he will see it through to the end, even when — as Chilperic does — he secretly admits his opponent’s innocence. Interestingly, the case does not initially begin because of Fredegund but because Chiperic hears that Praetextatus ‘was bribing people to against his [Chilperic’s] interests.’ It is only later that Gregory brings in the Fredegund connection. Later on, after Chilperic’s death, Fredegund and Praetextatus will have a run-in again. But Gregory’s portrayal of royal women is a discussion for someone else. Praetextatus is accordingly sent into exile and only recalled after Chilperic’s death. This story about the book of the canons is very intriguing. I like first of all that Gregory says nowhere whether this was a forgery, but he obviously thought so. It’s more than a little suspicious that the sought-after canon is on a ‘newly-copied four-page insert’. And Gregory says that these only appeared to be apostolic canons. He is saying without saying it that Chilperic doctored a manuscript to get the desired results — and he went straight to the source, providing apostolic canons, not ones from a church council or a pope, but the Apostles themselves. Did Chilperic think the bishops would be deceived, or did he assume they would just give in at this point? Gregory, at least, was not deceived. What gave Chilperic away was the fact that the quire was newly-copied. It didn’t match. It was not, as a modern person might assume, the fact that the forged text alleges to be from the apostles. This is because there is a text called the Apostolic Canons, and it was included in many canon law books throughout the Middle Ages. Forgery is a not uncommon phenomenon in canon law. The very Apostolic Canons, or the text known as the Apostolic Constitutions, are forgeries. We have at least one forged letter of Leo the Great. In the mid-ninth century, a group of canonist-forgers known as ‘Pseudo-Isidore’ forged an extensive series of papal letters from the ante-Nicene period. The Chilperic forgery in Gregory is an egregious example of someone making stuff up simply to get his way. While that tends to lie beneath all forgeries, it is also the case that many medieval people made forgeries in the name of someone who, they believe, would have said what the forgery said … if only they had said it. And I’m fairly sure the Apostles would not have been keen on murderers and adulterers as bishops! Finally, this story also reminds us of the fragility of the integrity not only of any text, but of compilation-style texts — by which I mean a series of canons, into which any unscrupulous character could slip in a new canon or even silently remove one and renumber it all. But not only canons, but sources such as the Sayings of the Desert Fathers or those trendy Jesus-sayings-sources like the Gospel of Thomas. The job of the text critic is to engage in textual archaeology and unearth the truth about any potential interpolations and to never take a text claiming apostolic authority at face value. Gregory of Tours seems not have, either. This entry was posted in Books, Christianity, History, Mediaeval and tagged apostolic canons, canon law, chilperic i, fredegund, gregory of tours, history of the franks, manuscripts, praetextatus of rouen, textual criticism on February 6, 2015 by MJH. Last Saturday I attended a very good conference, ‘The World of Caesarius of Arles’ organised by Lucy Grig at the University of Edinburgh. The excellent papers gave insight into Caesarius and the world of early sixth-century Arles/southern Gaul. One of the more interesting papers presented was that by Conrad Leyser (the name of which escapes me and I don’t have my notes to hand) about what Caesarius actually preached in his sermons. Do we know? The answer is maybe. The problem with the text of Caesarius’ sermons is that over one hundred of the 238 in Morin’s CCSL edition were either anonymous or attributed to someone else in the manuscript tradition. This is not, of course, always a problem, but it seems that Morin’s methods in determining which sermons were Caesarian were less than scientific. Nevertheless, during a coffee break, another notable Caesarius scholar said that, while this is an issue everyone knows, he has a feeling that Morin was right a lot of the time. The way forward, of course, is to re-evaluate the entire corpus and the 1000 mss consulted by Morin over his 40-year project according the principles of modern textual criticism. This is easier said than done. My recommendation is to take as a starting point the methodology that is arising in relation to the study of ancient letters — the discrete collections. This way, we would start with the three sermon collections attributed to Caesarius in the mss, edit them, and then use them as a nucleus and basis for our consideration of the remaining 100+ sermons Morin’s edition of Caesarius’ letters. What we must admit in the face of so many sermons and so many manuscripts is our own feebleness and fallibility. One of my fellow-PhD students who was present at the conference, in conversation with Leyser and William Klingshirn, said that his faith in modern scholarship was being sorely tested by these considerations — including the fact that everyone knew this about Morin’s edition but tended to ignore or, alternatively, make mention in the preface to their work on Caesarius but go on as though everything was okay anyway. And Klingshirn said that we tend to act like this all the time — which was even more troubling to my colleague. Classicists, he observe, pretend that the latest or chosen critical edition of an ancient author actually does present the exact wording of the original writer. This is a fiction that is almost necessary for scholarship — the other extreme is, of course, skepticism about the text that is so severe that one denies the knowability of anything an ancient author wrote. Most of us would like to steer a middle course. One of my colleagues found a way around this for a commentary he did for the Greek Old Testament (Septuagint) text Baruch. He simply used the biblical Codex Vaticanus as his text. This, at least, was a text used by real people in real places at various times in history. And so we come to Leo. How am I to interact with the text as I edit and translate? As editor, I will have to choose — or even emend — the reading I find most likely. But at least there I can give the variants. The critical apparatus — that body of footnotes lurking at the bottom of the page of good editions of ancient/medieval texts — should be a window onto the manuscripts, so that if readers dislike my choice, they can find out the content and perceived quality of the other choices available. As translator, I will have to present my own English interpretation of the pope’s Latin; I intend to discuss important Latin words and variants in my annotations — fear not. But at the end of the day, there will always be a certain amount of ambiguity concerning the exact wording of any text for which we lack an autograph (that is, a copy in the author’s own handwriting) — which is most ancient and mediaeval literature. However, this does not mean we should stop commenting on Homer or Caesarius or Leo or the Bible. Very often, editors are right. Very often, the scribes are right and the editors’ job is easy. Let us take comfort in that as we sit down with our Homer or Gilgamesh or Bible this evening. On the other hand, it does not mean we should uncritically accept the conclusions of the textual critics and editors — they, too, are fallible persons. There is a chance that some of M L West’s obolised (that is, marked as ‘inauthentic’) passages are, in fact, ‘authentic’. There is a chance that, however many editions of the Nestle-Aland Greek New Testament they end up producing, they will still err in their editorial choices. The critical reader and interpreter of the text should be willing to point this out. In short — even with Caesarius, there is a chance that what we are reading is the original writer. Let us, therefore, continue reading and interpreting, but always with an eye at the marginalia and footnotes. 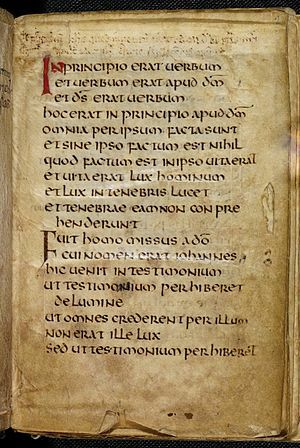 This entry was posted in Ancient World, Books, Christianity, Classics, Literature, Mediaeval, Patristics and tagged caesarius of arles, conrad leyser, early middle ages, late antiquity, leo the great, textual criticism on March 22, 2013 by MJH. I leave for Oxford tomorrow. I’ll be there for two weeks. 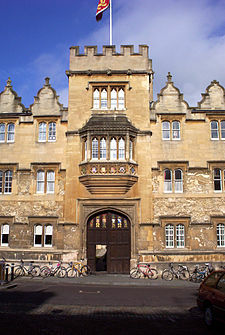 Although I will visit several colleges and a couple of museums whilst there, the main event will be the library of Oriel College, which contains a manuscript (henceforth abbrev as ms) that I will spend most of my days consulting. In consulting this ms I will have with me print-outs of the 48 letters of Pope Leo I that the ms contains. These print-outs are of an edition of Leo’s letters published by the Ballerini bros in 1757. I will mark on my print-outs the variations/discrepancies between the ms and the Ballerini. Because I am thorough, I will mark the variations in spellings as well as when the words themselves were entirely different. Sometimes the ms may be missing an entire line or two of text the Ballerini have; sometimes the ms may have a few words the Ballerini lack. It sounds a lot like proofreading, as though I am proofreading the work of the Ballerini bros against an actual mediaeval ms. Except, actually, I’m proofreading them against one another. And I’ll be proofreading them against a 31-page list of mss scattered throughout Europe containing various of Leo’s letters. Some of the differences I will notice are possibly errors on the part of the ms, possibly the Ballerini — some of them, I may conclude that neither the ms nor the Ballerini were right in light of something another ms elsewhere may say. Very few of these mss I’ll be reading over the next several years will be the same, you see. The ms I will read this week is from the 1100s, containing a collection of papal and ‘conciliar’ (ie. church councilly) material compiled at the beginning of the sixth century. That puts it seven hundred years after Leo actually wrote his letters and 650 after the compilation of the collection. There are many different people between Leo and this ms. Some of them copied Leo’s original letters for circulation within his lifetime. 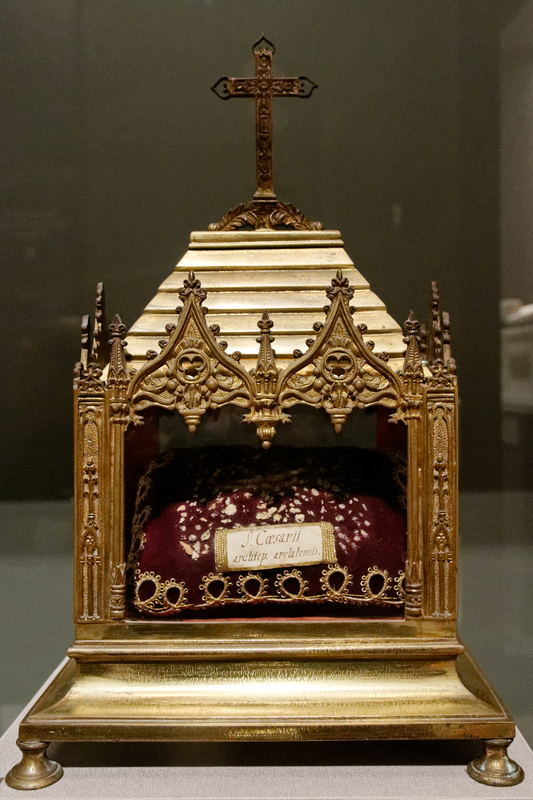 Eventually, some other people gathered together bunches of Leo’s letters and wrote them together in books (codices), usually with other letters by other Popes, typically arranged chronologically, not only by pope but also within each pope’s body of letters. If you’ve ever copied something out by hand, you’ll know that it’s easy to make mistakes. If you’ve ever looked at an ancient or mediaeval ms, you’ll realise that it’s doubtless even easier to make mistakes in the copying of those. So imagine four hundred, five hundred, one thousand years of manuscript tradition before you get to the copy that sits in front of you. Each will have its enchanting differences. And my job is to look at the vast array of differences and decide which version is closest to what Pope Leo I wrote at some point between 440 and 461. Some mss and their family members will be more accurate than others. I will have to judge this by myself. Hence the idea that I am proofreading everything against everything else. And when it comes to punctuation and paragraphing and chapters as well as variant readings, I have the Ballerini and other early printed editions, and then Silva-Tarouca’s selection of letters he printed in the early 20th century, then Schwartz’s other selection of letters from the mid-20th century. The major variants — options that come up a lot or very early but which I will decide are not actually from Leo — I’ll mark in the notes at the bottom of the page in my final edition. This is what I do. Right now, I’m collating mss. Later, I’ll make a printed edition of the letters of Pope Leo I. It’s called textual criticism, and people do it to all texts, especially ancient and mediaeval ones. This entry was posted in Ancient World, Books, Classics, Mediaeval and tagged leo the great, manuscript collation, oriel college, textual criticism, what it is that i do on June 9, 2012 by MJH.